Find out how urban city development initiatives are fulfiling India’s need to comply with the smart city trend. Ever since the Narendra Modi-led NDA government assumed office in Delhi, the public discourse on urban development in India has been dominated by “smart cities”. However, debates on this topic have often been misinformed since there is a lack of clarity on what exactly a smart city is. Interestingly, the guidelines of the government’s Smart City Mission itself state that “there is no universally accepted definition of a Smart City” since “it means different things to different people”. While globally the term has become synonymous with the use of technology and data for improving various aspects of a city, in India the usage has been less precise. Much of the initial discussion implied that smart cities would be entirely new cities. In fact, the 2014 election manifesto of the Bharatiya Janata Party promised to build “100 new cities; enabled with the latest in technology and infrastructure”. Hence, when the Modi government announced its plan to create “100 smart cities”, the presumption was that India would get 100 new cities. It was only in June 2015 when it officially launched the Smart City Mission that the contours of India’s smart city policy got some clarity. One year after its launch, it’s now clear that the Smart City Mission is not about building 100 new cities– it instead aims to make existing cities, in fact only certain designated areas within them, smart. While the Mission also requires each city to have a pan-city initiative, the thrust is to develop a compact area within a city through retrofitting or redevelopment of an existing built-up area or greenfield development of a vacant area. While smart cities in India are now closely identified with the Smart City Mission, the vacuousness of the term has led to it being invoked for various forms of urban development. If we examine just Mumbai and its surrounding areas, we can get a sense of how different kinds of smart cities are sought to be created in different locations. Under the Smart City Mission, there are four different smart cities in the Mumbai Metropolitan Region- Greater Mumbai, Navi Mumbai, Thane and Kalyan-Dombivili. The smart city proposals of these cities focus on developing certain pockets of the city– Lower Parel in the case of Mumbai and Koperkhairane in the case of Navi Mumbai– and also promote the deployment of smart technologies. Interestingly, the municipal corporations of some of these cities had expressed reservations about the governance structure of the proposed smart cities and eventually, none of the cities in the region were selected in the first round of funding under the Mission. Independent of the Smart City Mission, the City and Industrial Development Corporation, a state government agency, is developing the seven southern nodes– Kharghar, Kamothe, Kalamboli, Pushpak, Panvel, Ulwe and Dronagiri– in its Navi Mumbai (South) Smart City project. The Corporation also has a greenfield urban development project near the new Navi Mumbai airport called the Pushpak Nagar Smart City, spread across 230 hectares. Much of the developments in the Navi Mumbai Airport Influence Notified Area, which covers 561 sq.km are also marketed as a “smart city”. The Mumbai Metropolitan Region Development Authority is the other state agency which has caught the smart city bug. It is developing Mumbai’s Bandra Kurla Complex as a smart city by providing Wi-Fi connectivity, surveillance systems and smart parking facility. It is also developing 5 hubs along the proposed 126-km Virar-Alibaug Multi-Modal Corridor– Vasai-Virar, Bhiwandi, Greater Kalyan, Greater Panvel and Pen-Alibaug– as smart cities. Along with state agencies, there are also private players which are creating their own versions of smart cities in the Mumbai region. Palava built by the Lodha Group is the most prominent example of a private smart city. It has partnered with IBM to introduce smart governance through measures like intelligent security systems. 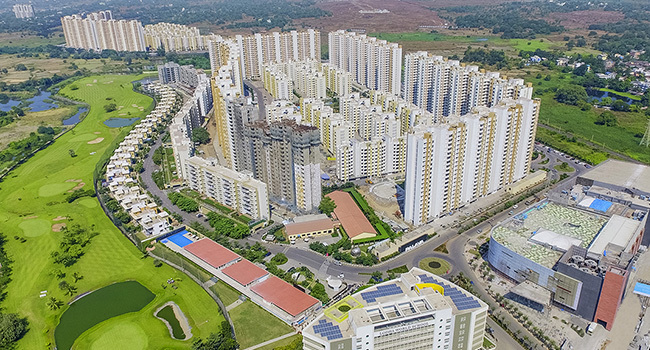 Another interesting initiative near Mumbai is the Khalapur Smart City where a set of farmers in 11 villages have pooled 3,550 hectares of land to create an integrated township in partnership with the City and Industrial Development Corporation. As the case of Mumbai illustrates, multiple avatars of smart cities are being built in various locations. The narrative on smart cities in India is hence not restricted to cities under the government’s Smart City Mission. Rather, the term is being invoked for a variety of modernist urban projects whether it’s building new cities, applying technological fixes to existing cities, development of hubs along industrial corridors, retrofitting certain areas within a city or building private townships. By invoking the term “smart city”, these varied urban developments are able to legitimise and market themselves better. Indian cities are dominated by unplanned developments, an informal economy and messy local politics. This urban realty is increasingly coming under challenge in the post-liberalised era with private capital seeking to reshape the nature of the city. In this context, smart cities are being promoted by the state and the market to create more ordered forms of urban development. The term “smart city” has thus become a trope for promoting a variety of capital-driven planned urban initiatives that is at odds with the predominant forms of urban realty in India. This article first appeared on Scroll. Read more of this interesting article on Palava’s website!